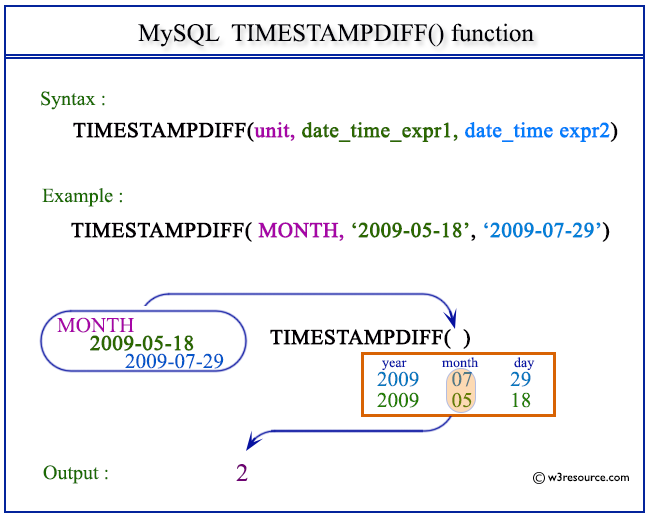 MySQL the TIMESTAMPDIFF() returns a value after subtracting a datetime expression from another. It is not necessary that both the expression are of the same type. One may be a date and another is datetime. A date value is treated as a datetime with a default time part '00:00:00'. The unit for the result is given by another argument. The unit should be one of the following : FRAC_SECOND (microseconds), SECOND, MINUTE, HOUR, DAY, WEEK, MONTH, QUARTER, or YEAR. unit An unit, as described in the description. The following statement will return a value in months by subtracting 2009-05-18 from 2009-07-29. The following statement will return a value in minutes after subtracting 2009-05-18 11:45:42 from 2009-05-20 15:16:39.